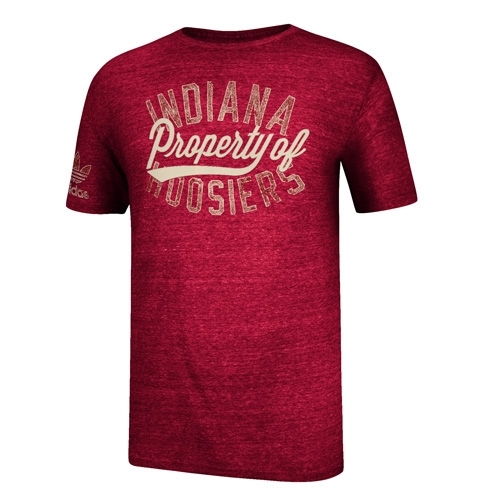 ADIDAS 'First Division' tri-blend t-shirt is a heathered crimson of a soft blend of 50% Polyester, 37% Cotton, 13% Rayon. 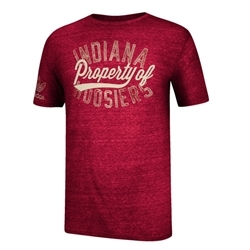 Screen printed on the front with INDIANA HOOSIERS and a heat applied felt applique of scrip 'Property of'. The large trefoil Adidas logo is screen printed on the right sleeve. Unisex (mens) sizes.